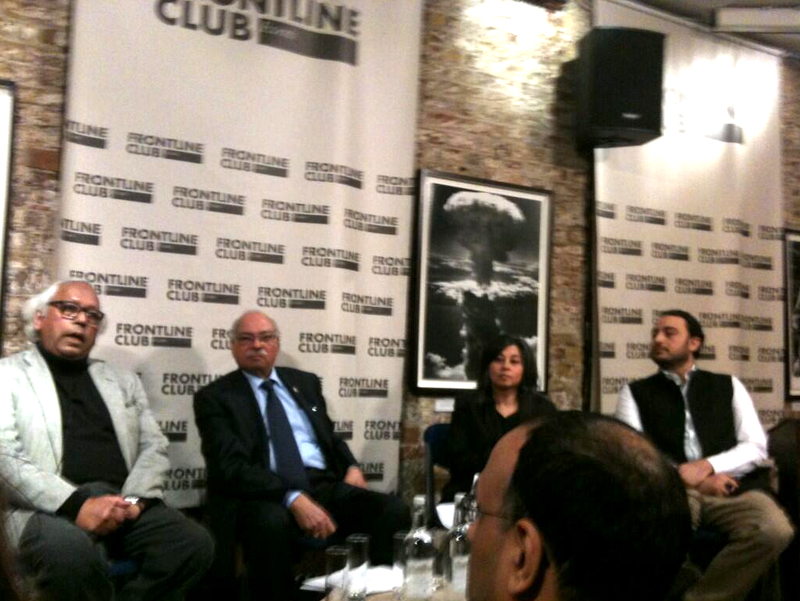 As Pakistan gears up for crucial general elections in just over a week, on 1 May the Frontline Club hosted a panel discussion, First Wednesday: Pakistan goes to the polls, to consider the country’s prospects. The panelists on the evening were journalist and author Irfan Husain, Pir Zubair Shah of the Council on Foreign Relations, Umber Khairi, a producer and radio broadcaster with BBC Urdu at the BBC World Service and the High Commissioner of Pakistan to the UK, Wajid Shamsul Hasan. Chaired by Paddy O’Connell of BBC Radio 4’s Broadcasting House, the debate aimed to give an overview of the main political parties contesting in the election – to be held on 11 May – marking their distinctions along religious and political lines. They also discussed their electioneering pledges as well as the ensuing threats and violence at rallies. The role of the military, which over Pakistan’s 65 year history has toppled many elected governments, was also discussed. However, protracted legal disputes over its role in recent years has resulted in banning the country’s last military ruler, General Pervez Musharraf, from contesting. Forecasting the outcome of the elections, the panel agreed that a coalition was the most likely outcome. High Commissioner Hasan said that rural areas of Pakistan held majority votes and was therefore less hopeful for the prospects of PTI as it is more urban based. However, he foresees Pakistan People’s Party (PPP) making large scale gains in its traditional heartland province of Sindh, as well as sweeping the votes in Southern Punjab with its coalition partners.